Would you do at home rehab exercises with your handicapped dog? Most pet owners know that rehab exercises benefit a dog with a spine injury or a neurological condition because it gives them more stamina and strength, but the majority of us are not doing any ongoing therapy. In my situation there wasn’t a canine physical therapy clinic in Las Vegas when Sophie became paralyzed. Fortunately a rehab center is available now. We went for acupuncture treatments and chiropractic adjustments, but there was no one available to teach me how to perform range of motion exercises or a therapeutic canine massage. I think the situation is similar for many pet parents. They would like to know how to do these exercises to keep their paraplegic dog as fit as possible, but they don’t know where to begin. To address this problem I decided to research canine physical therapy and ask some experts for the 5 basic rehab exercises your handicapped dog can do at home, with your help. Caveat: Please check with your veterinarian before trying these exercises with your pet. In addition, keep in mind that the number one rule of physical therapy is to stop any exercise that it is painful for your dog. Strength training: This rehab exercise is a good way to keep your dog’s core as strong as possible. Strength training is excellent for dogs who are recovering from spinal surgery because it will help them maintain their balance and ability to bear weight. It is equally beneficial for paraplegic dogs who need to have a strong core to hold up their belly while they use a wheelchair or other mobility device. The exercise has the dog lie on their side while you gently use their limbs to roll their body from side to side. If your dog tolerates this movement you can add a big balance ball to the routine. Lie your dog face down on top of the ball and gently roll the ball from side to side while your dog controls the balance. Light Massage: This is a great exercise to reduce muscle spasms, enhance muscle tone and increase circulation. The exercise places your dog in a lying down position while you gently rub and massage each major muscle group. Start at the shoulders and front limbs and slowly move down to the hind end and rear limbs. This is not a deep tissue massage, but a gentle slow rub down. Hydrotherapy: Controlled and monitored water therapy has proven to be beneficial for disabled pets. It makes a dog use a full range of motion of their joints while improving their muscle tone and stamina. There is even evidence that hydrotherapy might create new pathways in the nervous system. The Internet is full of photos of dogs being held up by a lifejacket while a physical therapist gently moves them through the water. The exercise can be recreated at home with a child’s wading pool and your complete attention. Never leave a paralyzed or partially immobile dog alone in a pool. With your dog wearing a dog lifejacket, hold the dog up by lifting on the jacket and place your second hand underneath your dog’s belly or upper chest (depending on their spinal injury). Then slowly move them through the water making sure their head is always above the water. Go outdoors: Whether your dog is in a dog wheelchair or moving around with the help of a harness, be sure they spend time every day outdoors. Fresh air and playtime can be good medicine for a disabled dog. Moving around is mentally stimulating, increases a dog’s appetite and improves digestion. The exercise is to grab your shoes, put your dog in their wheelchair or harness and take a walk. Getting outdoors will work wonders for your dog physically while giving them the opportunity to sniff around their environment like they did before they became immobile. Talk to you dog: Your disabled dog is not just the sum of their injured body parts so remember to talk to your dog. You are the whole world to your pet and gentle words of encouragement can go a long way to help them stay strong and engaged in life. In addition to rehab exercises, canine physical therapist, Laurie Edge-Hughes, suggests that pet parents learn some basic nursing skills for their paralyzed dog. This includes the prevention of pressure sores by moving them every four hours, washing them daily with a soft wet cloth to avoid urine burns on their skin and monitoring for bladder infections. With help, your disabled pet can live a happy and long life. Disclaimer: The following are some general suggestions that may be helpful at home. A formal program for a pet’s specific issues is ideal because it is based on the pet’s individual joint extension/flexion measurements, force plate analysis, muscle circumference measurements, etc. If possible, a professional veterinary physical therapist should be consulted formally for a program. 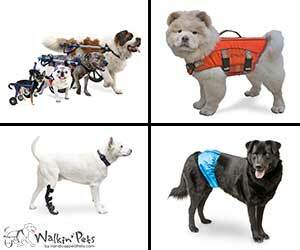 Walkin’ Pets by HandicappedPets.com has a wide variety of products to support you and your paralyzed pet. Thanks Sharon for putting this together. These exercises are also probably good for senior dogs that maybe aren’t handicapped but don’t get a lot of exercise. Unfortunately, we’ll be doing some rehab exercises in our home soon as Haley has ruptured her CCL and is going to be having surgery on Monday. Our vet mentioned that her recovery success depends a lot on the rehab exercises, so we’ll all be working hard here. I’m sorry to hear about Haley’s knee. I’ve also heard that rehab after CCL surgery will help her heal quicker. I imagine they will work on her balance so she doesn’t put stress her good leg. Good luck with the surgery and recovery. Such a wonderful post of good things to do for our furry friends. I love saying talk to your dog because it is so important to keep them positive and they look to us for reassurance and love. I couldn’t agree more Julie. Encouraging your dog with words goes a long way to help a disabled dog feel safe and secure. How long should a session of hydrotherapy be? We have a pool that is kept at 82 degrees. Hi Mark, That’s a good question, but one that your dog’s veterinarian should answer. Every dog’s medical condition and stamina are different. I do know that you can do hydrotherapy at home and other pet owners have been successful using this method. If you are going into a pool I recommend getting a lifejacket for your dog and asking your vet about the specific exercises to be done for your dog. Let me know how it goes. Hi I have a 6 yr old German Shepard who has been a happy healthy active dog up until last Sunday. She eats taste of the wild 2x a day. Drinks a lot. She’s a small frame GSD but Weighs about 75. She had high level Lyme about 3 yrs ago and treated with high dose doxycycline. She’s intact and had a 3-4 week heat cycle about 7 was ago. After 1 wk no more blood she started to have bright red bleeding occasional dime size dk clot type but acting fine. That lasted about 5 days. Then about 7-10 days later this occurance out of nowhere. Her eating has decreased from full bowls 2x a day to 1/2 to 1/3. Not normal but she is a routine dog but if our routine changes causing hers to change and if we don’t sit and eat She will either not eat or eat less. Again. Not too unusual, if I go away she could skip eating 1 almost 2 days waiting for me to come home. Sunday she ate well about 9 and some about 5. She Went out as usual at 9 and 2. She didn’t go out after 5. Didn’t want to. My son left about 530 she was laying in her reg spot. We came home about 715 to find her barely able to stand up and falling over trying to get to my son. She then was unable to stand at all. He carried her to the car noticing her tongue was sticking partially out of her mouth and agitated. Brought her to emergency room where after exam the dr found her BP very high. Facial paralysis tongue unable to retract. Legs showing partial paralysis. Neurologically not well. No leg strength. Blood work panel came back ok. First thought serious toxin. Explained rapid onset. Brain to 4 legs not a good sign or easy to diagnose. She can drink eat blink and close eyes but still neurologically off. Legs remain no reflex or strength. Brain not telling legs to stand or move. Already over 3k we can’t afford MRI or spinal taps. Stating even w these tests even if the can diagnose still may be too late to reverse or may require surgery I’d mass or cancer, again after that may not reverse or save her, Lyme shocking was negative. They agree to try high dose of steroids and keep her 1 more day. We take her home. Alert, tail wagging and small periods of energy. Non mobile. At home she shows slow signs of improvement but strange reaction 3 times after eating her regular taste of the wild food. Almost looks like mild silent seizure preceded with gas and followed with scratching and biting and licking and breathing strain. All subsides quickly. 2 times Wednesday 1 time Thursday changed food and these strange food/eating occurences stop. Last night and today she is trying to get up and manages to get 4 legs under her and partially get up to move about 2 ft twice before volapse. Today her 4 legs hang correctly toward the ground and she attempts to do walk motions with my son holding her off ground is a front to back harness. Some resistance. We see progress even slight in 4 days. Hoping a quad cart can offer some freedom and PT and maybe convert to hind leg wheelchair if front gets stronger (hind much worse than front) what can you suggest? Paula, I am very sorry to hear that your family and your dog are going through this. It sounds like all of you have been through a terrible week of tests and trying to find answers. Does your veterinarian think your dog might have had a stroke? I ask because of her facial paralysis. Some breeds are prone to them. Is your dog in any pain? A quad cart might be helpful to move about and a lifting harness might also help you lift her. My blog has a story on the side page of the different types of harnesses. Does she knuckle her paws? Since this is so new you might want to have her on bed rest and see if the situation changes. I would have guessed about toxins too. I am not a veterinarian so I hate to give advice without you knowing a diagnosis or seeing if her condition changes in the next few days. Please send me an update after the weekend. Best wishes. Change her food. The food could be contaminated with something toxic. Your situation doesn’t sound exactly like mine, but the eating thing caught my attention because my dog has an eating based trigger as well and through my endless searching on the internet and the tragically disappointing proclivity towards tunnel vision that seems to run across the board with veterinarians and specialists, I’ve been unable to find any other reported cases of this. I say eating based because we’ve gone from a store bought raw diet to a home cooked whole food, grain & processed sugar free diet loaded with supplements from kelp to turmeric and it hasn’t changed that aspect appreciably. 9 months ago in March my oldest & dearest friend Stella (12 yr old chihuahua- 7llbs)went from getting what our vet said would be her last round of vaccinations because of her size and age and a gushing gold star review of good health to 2 weeks later lethargy followed by neck pain then the first of the real terror a grand mal seizure followed by an unceasing cluster seizure (before that, I don’t even think it’d even occurred to me that dogs had seizures) & to make an extremely long, expensive, sleepless, morally fraught, and isolating experience shorter, where we are now is a diagnosis of IMHA, and a “working” diagnosis of GME (since the mri showed inflammation of her entire right hemisphere, but no lesions or tumors), partial to full blindness from the seizures in the beginning, and moderate ataxia. She doesn’t really seem to notice or care on most days, and has outlived even the most generous estimate we were given when we were being warned about how much work our decision to provide palliative and hospice care would be, she even seems to be pretty delighted with my decision to take a year off from school to hang out with her. The most consistent thing though, is her passionate love for food and treats.. for eating in general. Which brings me to the point.. her seizures are mostly under control but after experiencing a seizure a dogs brain is more prone to have continued seizures and the more seizures the easier it becomes so she still has about 1 30 sec seizure a week, the time between them shrinking or growing depending on various factors, but without exception they have occurred about 2-3 bites in to her final meal of the day (she has 4 small meals on a strict schedule because her medications can be tricky regarding dosage times) and I can always tell on the day of that she’s going to have one. It seems like that must mean something, but what seems like an obvious correlation to me has been seen as more of an odd coincidence to her doctors. Anyway, sorry for the novel.. that IS the incredibly condensed version, believe it or not, but I’d love to know if there was any sort of connection made or even any interesting theories or insights anyone had. I realize this is a pretty old post and hope everything turned out ok, but I know what a struggle it is to get anyone to think outside of the box and not just write off medical anomalies as lost causes so i understand that may not be likely. Either way, thank you for caring enough to search for answers, it’s helped some just knowing that at least one other family out there has had an even remotely similar experience. Some times, in moments of grief, what hurts the most is feeling like the whole world should be grieving with you for this extraordinary loss but No one seems to really care, and instead of looking for answers that may be too late for her but could potentially help another beloved pet down the road I don’t know seems sufficient and it was all for nothing. At least that’s how I’ve felt. So I wanted to tell you that it means something to me, and to thank you for making me feel less alone for a second. Stephanie, I’m sorry Stella and you are going through this ordeal. I personally haven’t heard about seizures being caused from the act of eating, but I have heard about small dogs having neurological problems after being vaccinated. Is your veterinarian sure her disorder doesn’t have something to do with her last set of vaccinations? Here is a link to a story you might find interesting: https://www.dogsnaturallymagazine.com/why-vets-dont-recognize-vaccine-reactions/ I hope you solve this mystery. I am not a dog expert by any means. But I have been through something similar myself. I personally have food triggers seizures. I was having up to 30 seizures a day. Doctors couldn’t get them under control. Then I stopped eating gluten because I had other gluten allergy symptoms. 3 days later my seizures went away. I never thought that would be a side effect. Even in the gluten allergy world, seizures are a rare symptom. I’m not saying your dog is allergic to gluten specifically, but maybe allergic to something in their food. Especially since we aren’t always born with an allergy, they can be triggered. Which would explain why she was fine until those vaccinations. Jessica, Thank you for sharing your experience. Praying these things help! Our boy, Griff, was hit by our mailman and has no movement of his back legs as well as no control of his pee or bowel movements. We are 4 1/2 weeks in and not much progress has been shown since he has been at the vet. We just got him home on Tuesday so we will begin these excercises! Whitney, I’m sorry to hear about your dog. In addition to these exercises there is a great book called Physical Therapy and Rehabilitation for Animals by Susan E. Davis PT. You’ll find it on Amazon. I also recommend that you check with your veterinarian before starting any rehab program. Best wishes to Griff. Hi – Glad that I found this page. We adopted a 6-month old lab mix almost 2 weeks ago from a rescue. They told us that she had a disc issue which was noticed when she was being spayed. They took x-rays, which we are still waiting for, but recommended that she be euthanized. That didn’t happen obviously. Our vet checked her over and our pup has a swollen lymph node on one of her rear legs which was aspirated and showed no signs of cancer. Zora has some drag with her rear legs and she will clomp her right foot when she is walking and/or clicks both rear feet when walking. We are taking her on short walks and about 1/2 way through, she will start bunny hopping but shows no desire to quit the walk. Her rear feet and nails are showing wear from the dragging so I am looking for boots to help protect them. I haven’t found any yet that will stay on her feet. She has a little issue with chewing but its minor. Our vet did not diagnose Zora and instead said that we needed to see a neurologist, which we can’t afford. I am still hoping that the x-rays will arrive soon and will give us an indication of what the problem is. In the meantime I have been looking for physical therapy that I can do at home with her. Glad that I found this page. Do you have any suggestions? She is a loving, happy puppy and I’d like to give her the best life I can. Ron, You are a hero for saving Zora. The clamping your puppy is doing when she walks is called “knuckling.” I am not a veterinarian, but this is what dogs do when they can’t feel where their back paws are when they walk or stand. I hope the x-rays come soon because they will explain or at least rule out common problems such as a herniated (slipped, ruptured disc). While expensive, the neurologist can also help diagnose or rule out disease or birth defects. That said, I think a consultation with a canine physical therapist is a good idea. You should get a good assessment there. As far as boots for your dog, check out a website called WalkAbout Harnesses. All of the products are made by a canine physical therapist. They have boots and lifting harnesses that might help your dog. Please let me know if you have other questions. You can also sign up for regular updates or join our Facebook page. It will give you the opportunity to communicate with owners going through your situation. My daughter, Sidney is 11 years old. We rescued her as a puppy & it is not definitive of her mix (despite 3 DNA tests). However, most vets say Australian Shepherd/Keeshond mix. As she has always been hypersensitive to storms, I keep an eye out for injuries related to episodes of frantic attempts to get to what she feels is safety (i.e. : climbing onto counters, getting behind couches, crawling under the bed). About 4 months ago, I noticed that she was very slightly dragging one back foot. It was easy to notice as our entire house is tile floors & I could hear it. We immediately took her to the vet, fearing she had injured her back during one of her storm terrors. The vet did an x-ray, blood work, exam and felt that she might have a disc problem. She was put on several trials of meds. Gabapentin, prednisone, antibiotic. Had us walking her for 15 mins. daily. She continued to get worse. This was very sudden & deteriorated very quickly. She started seeing a neurologist 1 month later. He put her on a higher dose of gaba & trazadone to calm her so that we could immobilize her as much as possible for 1 month. Still no improvement. I’ve also noticed that she has started involuntary kicking her hind legs in her sleep. A month ago, the neurologist brought up Degenerative Myelopathy. Had us do a genetic test to rule it out before spending the money fir an MRI. She came back positive for both gene mutations. The neurologist went from “Ir’s unlikely” to “She’ll be a quadropalegic within 6 months”. We’ve just started aqua therapy & short walks 2x daily. She has deteriorated so fast that I’m having a hard time accepting that it’s DM. There was no slow progression. One day she was fine, the next, she was dragging her foot. Now, 4 months later, she can barely walk without tripping over her twisted back legs. Please do not give up hope. There is support at the Lessons From A Paralyzed Dog Facebook page and in articles in this website. Thank you for your response. She has no deterioration of her front legs at all, thus far. I’m frantically searching for a neurologist that has studied with Dr Clemmons. I’m very concerned about her neurologist just writing off the medicines & supplements that Dr Clemmons at UF has found to extend the time to paralysis in 87% of those on the protocol. If Sidney does have DM, I want to get her on the Clemmons protocol asap. If not, I need to find out what is wrong with my baby. Hello my dog Oscar had the same symptoms and our neurologist is almost 100% sure he has neosporosis. Which is a protazoin infection. If treated with antibiotics asap it can be cured. Unfortunately Oscar isn’t improving much. I’m trying different things with him to help fight this after I researched what it is. I just thought I’d mention it because it’s not very common and often overlooked. Many vets don’t know much about it. Stacianna, Thank you for offering this suggestion. My 10 year old Shih Tzu suffered a stroke on July 29th. At first the neurologist thought it was s disk compressing her spine, then did an MRI and found the stroke. We brought China Bear home on Aug 3rd. Her head leaned over to one side, and she was unable to lift herself or walk. She can move her limbs. We’ve been doing range of motion exercises and massages several times daily. Im also using different essential oils while massaging her. Those safe for dogs. After having her home for 5 days, I see some improvement, but not a lot. Her legs are not as stiff, more manageable. She peed and pooped outside with my assistance standing. She can now drink out of a bowl, but needs assistance being hand fed. Her head has gotten better but it rolls back and forth a little sometimes. She has been my baby for 10 years. I want to give her the best chance at a normal life. I’ve been using a towel as a harness to help her walk and it’s killing my back. I have RA , CMS and kidney disease. This has taken a toll on me financially ($4k to date) and physically. Im disabled and live alone. And beginning to get depressed about whether or not she will get better. Im desperate for someone to tell me if China Bear still has a chance of a somewhat normal life? And if anyone knows of stories where dogs have made almost full recoveries? And also, if anyone knows of more that i could do to bring her around quicker, i would surely appreciate it. Resources in my area, rehab harnesses, etc. Feel free to email me at janiedress@gmail.com. Thank you so much! Janie, I am terribly sorry to hear about China Bear. Please don’t rule out any hope for your dog’s recovery. I’ve written several stories about dogs with strokes and you can read about a dog named Mia who made a full recovery. Physical therapy like you are doing is important and Mia had great results with a hyperbaric oxygen chamber. I will email more details to you, plus information about harnesses for handicapped dogs. In the meantime, please check out this article: https://lessonsfromaparalyzeddog.com/dog-stroke/#more-1157. Thank you so much for your response. It feels good to hear from people who have actually been through this! China Bear actually got up on all fours and walked a few feet a couple of times today. Before this, for the past few days, she would only try to move up against a piece of furniture or wall because she kept falling over. So I am seeing small bits of progress each day! Praise God!! I have a couple more questions. My vet neurologist wanted to see her back after two weeks to reevaluate her. Is that something I need to do? I cannot afford to put several more hundred dollars on another credit card for this if it is unnecessary. However, they mentioned doing more bloodwork to help make sure she isn’t diabetic or have Cushings disease. Also, I was told by them that the chance of another stroke is very high. This really concerns me!!! I want to do everything I can to keep that from happening again. Any ideas? I have realized, while trying to do research to help my baby as best I can, that there isn’t much info available. I am going to try to do a video of China from start to finish with timelines. Something that will show people that they CAN get better. And what I did, that I thought might have helped her along. Thank you for any other info you can give me!!! China Beach is doing better. But it has been a SLOW process. She got a bad respiratory infection and coughed constantly for several days. We got through that successfully. She is walking MUCH better, but is weak in her rear right side. When she squats to pee or poop, sometimes she falls over to the right. However, she can use the back right leg. It just seems to still be weaker than the others. And it has been several weeks since her episode. She also seems to still have some vertigo. When she lifts her head (some days are worse than others), her head shakes a little. She looks drunk when she walks because her whole body pulls to the right. Anytime she can lean against something on the right to walk, or climb, she definitely will. The main problem she’s having right now is, something in her right neck or shoulder will get painful after she’s walked a little around the house. They found a disk issue in the neck on that side, but couldn’t operate because she is high risk due to collapsed trachea issue. She cries out loud a lot and will try to nip you you if you go to that side of her like you are going to pick her up. I still have to carry her around like a baby a LOT. And I don’t leave my house for very long because I don’t want her crated for too long. When she starts barking, it aggravates that right front side issue. I was just wondering if anyone with the same vestibular type issues, actually had a pet that took it this long, or even longer, for them to get to the point where they were not wobbling and shaking their head still. Is it possible that China Bear will continue to get better, or am I now going to have to accept the fact that I will no longer be going on any vacations without her, or leaving her side for very long at all, until she passes. I will do anything I can for her. Because she is still not 100%, it is causing an issue between me and my partner. I use her as an excuse for not being able to go on trips now, or even leaving for too long. And I still have her in my bed because she is sometimes in pain. Just wondering if anyone knows if she will actually get even better??? Thank you! Janie, I am sorry to say that I don’t have an answer to your question about whether China Beach will get better. I suggest you rely on the advice of your veterinarian. The vet knows your dog’s medical history and can make the best judgements about her care. I understand how overwhelmed you must feel with having to carry her and seeing her in pain. If you like I can ask your question to readers of our Facebook page. We may have an owner whose dog has vestibular disease. Please let me know the specific diagnosis for China Beach and I will be happy to ask your question to readers. Hello, my Bubba had a stroke 2 1/2 weeks ago. He is making small progress still unable to walk or get to potty or eat on his own. Any information on rehab or the hyperbaric therapy would be appreciated. Where do you get hyperbaric treatment for dog? I have a life vest and put him in tub but he didn’t seem to move his limbs much at all like swimming. He can move his limbs but when I support him to sit sometimes his front toes curl under. Please help. Dedra, I’m sorry to hear about your dog. Your veterinarian would be your best resource to find the closest facility with a hyperbaric oxygen chamber. Or you could search online. I also recommend that you look at Mia’s Journey to Recovery on Facebook. Mia’s owner put together a video of the dog’s treatment and recovery from a FCE stroke. It included the rehab exercises I mention in the article, hyperbaric therapy and water therapy. Please check with your veterinarian before starting any rehab for your dog. Best wishes. Thanks so much for the information. Buddy suffered a running fall and has FCE. This right leg is improved in a week to almost normal. He does not want to put weight on left and curls his knuckles. Never any pain. Am doing the passive and up at least once an hour walking with sling. Should I make him stand on weak leg -maybe a minute at a time? Dogs with FCE do well with hyperbaric oxygen therapy and physical therapy. You might want to ask your veterinarian about that. There is also a no-knuckle sock you can find at Walkin Pets. It sounds like your dog is recovering so maybe it is a matter of time for the left leg. A week is very soon to expect a full recovery. Hang in there, you and your veterinarian might just need to add a few more modalities to see the improvement you want. Best wishes. Thanks very much. This a very helpful website. My dog can stand on both legs but will drag left when walking. Standing to eat! So will look into watrr therapy here. I hope the therapy helps your dog get stronger. What is your dog’s diagnosis? My dog’s diagnosis is FCE from a fall while running. (mRI)11/2 weeks. Functions back to normal but dragging left hind leg. Standing to eat. Passive rotation exercises 3x daily. Has pain when pinching between toes. Martha, These are all good signs of your dog healing. I hope you continue to see improvement. Thanks so much for replying. I will post progress. Goes back in a week to the neurologist. Progress is going very well. Buddy suffered a fall 9/3/17. Spinal embolism according to mri. Doing passive exercises. Took Buddy to ARRC Rehab and Conditioning for underwater treadmill therapy plus other exercises. He is now walking with a slight limp,left back limb still weak but getting better, knuckling off and on . This has been a month. I recommend going to a certified animal therapist. Hi, My much loved dog Cedrick, he is 4.5 yo and a Maltese shitzu X Staffy, beautiful and the loveliest temperament, I have both he and his sister Millie. On the 22/12/17 I called Cedrick to jump up on my bed and he couldn’t, I immediately was looking for a tick, no tick. I took him to the vet and we walked in, he on a lead, to be honest he looked fine except at this point when I patted my knees for him to put his paws on my knees he couldn’t do it, the vet was concerned, they looked for ticks, no ticks, did blood tests for snake and a few other things all came back negative, the vet asked if I had fed him raw chicken, I give all my dogs 2 chicken necks for breakfast, good for their teeth. Cedrick stayed the night on a drip and to be monitored, the vet phoned me the next morning and let me know he had lost the use of his back legs. The vet was unsure what was happening, I went into town to visit my little buddy and spend some time with him, the vet though it was cartilage or disk damage but when the vet put his hands under his belly and lifted Cedrick didn’t make any sound or movement from discomfort, at this the vet discounted spinal damage, Cedrick was in Care at the vets for 3 days and nights, the vet was telling me he was happy, healthy, good appetite, drinking lots of water and in no pain. The vets had started antibiotics and steroids. I brought him home with his back legs still paralysied, I have to empty his bladder, but Cedrick empties his bowel, he lifts his tail and empties, I am massaging his thighs and exercising his joints. I googled “ raw chicken and dogs” and I started reading about Coonhound paralysis, which is an American diagnosis, but we do have it here in Australia, seems it could be a bacterial infection in the nerves which is why the paralysis, I just need to know will this bacterial infection stop and the use of his legs return. Can anybody help me,please. There is actually a wide variety of conditions that could be affecting your dog. Do you have a veterinary neurologist in your area? They can be helpful with a thorough neuro exam or an MRI. I also wouldn’t rule out a problem with his spine. In the meantime, maybe you could do an elimination diet and stop the raw chicken to see if there are any improvements. I like that you are doing rehab exercises with him, but there is also a theory about putting your dog on crate rest to see if the spine heals. It would be interesting to know what the bloodwork told you. Are the steroids helping? Hopefully Cedrick’s body will heal, but I strongly suggest you get an opinion from a neurologist. Best wishes. My 11 year old Shih Tzu China Bear had a stroke last March 2017. She couldn’t move any of her limbs st all when I brought her home for a week in a Neuro ER. The vets told me to bring her home and just see if I could help her. There wasn’t any more they could do. I was determined to give her the best chance possible to not only live, but lead as normal a life as she could. I had to carry her outside and hold her up to go do her business. I bought her a Walkabout harness online that velcroed around her waist and when I held the straps, it made her feel as though she was getting around on her own even though for quite a while I was just lifting her up over the grass. The vet said to make her daily activities as normal as I could possibly make them. I used my own DoTerra essential oils on her (Used a lot of Frankinsense) 2-3 Times a day. Massaging her limbs and working her legs in normal walking motions for 30mins to an hour each time. I dedicated all of my time to her. I remember at week 3, I started getting discouraged that she would never walk again. But shortly after that, as I kept working on her, I started seeing small signs each day that she was getting better. First her front legs, then her back. By July, she was pretty much back to normal, with the exception of a little wobbling, as she is a little weak in her back right side. To add to her issues, she has a collapsed trachea and each time they would try to sedate her to do a procedure, she would turn blue. So that is out of the question now. If she had any major problems moving forward, I will need to just make her a comfortable as I can for as long as I can. But today, she’s even chasing her little sister around. She’s my heart and I would do anything for her. My story proves that you should never give up on your babies. So many people get tired and end up putting their pets down. The research I did and stories I found online showed that our little babies are far more resilient than we are. And given the chance, with our help, are little miracles themselves. I can’t tell you the number of times people would see how she was the first couple of months and look at me as if I were doing her an injustice by keeping her alive. And look at her now. I know it’s hard. Hang in there. I will pray for your baby. You are doing right by going online to get help. Leave no stone unturned. Massage those limbs. Deeply. Move them even if your baby doesn’t want you to. God knows China was glad for a break if I had to put her in her crate for a couple of hours and go somewhere. But I seldom did. If you use essential oils, get hem from a place that harvests them correctly. You will know because you will pay more for them. I trust the doTerra oils http://www.mydoterra.com/janiedress. But do your research on those too. Some oils are toxic to dogs. I would take a couple of drops of the Frankinsense and rub it at the base of her neck where her brain stem was. The others I used to massage her with I would dilute with Fractionated coconut oil. Essential oils have a lot of healing properties. I use them every day myself. I know that a mixture of everything I did for China is what helped her. I had decided that even if she had to get around pulling a little wagon behind her, we would do it. But she recovered. Nearly 100%. Janie, Thank you for sharing your story. I’m glad China Bear is doing better and that you didn’t give up on her. I’ve posted stories about the benefits of essential oils, especially Frankincense, but you are the first person to share their personal experience. I appreciate it immensely. I loved reading your story! My little chihuahua had a massive stroke almost 3 months ago and he still can’t get up. His right legs don’t work. They are moving a little in his wheelchair now. He also has the collapsing trachea and many other health issues. It’s so encouraging to read this! I have been working with him and helping him since day 1 even after at least 2 vets said to let him go. We took him to a neurologist. Thanks again! Stephen, It sounds like you are doing a great job with your dog. DM is an awful disease. Please check with your dog’s veterinarian before starting any of the exercises in the story, but if you look at them as a way to keep your shepherd’s muscles strong for as long as possible, they are worth doing. Not every case of DM moves quickly and it will still be important to keep your dog’s muscles strong and flexible. See what your veterinarian recommends. Do a little research on some good essential oils for your best friend. Give him a nice thorough massage each day. Add Frankincense to every oil you massage on him. ALWAYS mix the oils with Coconut oil as a carrier oil. Don’t use the oils on their skin directly. They are very strong. Please use GOOD oils like http://www.doterra.com/janiedress. Good luck with your baby! Thank you for this article! My chihuahua had a massive stroke almost 3 months ago and can’t sit, stand, or walk yet. His right side was affected. We built him a wheelchair that is helping some and his right legs will move some when we have a treat for him 😊 we are really struggling to get him to use his right legs and his front foot turns under. The last time I put him in the bathtub( it’s winter and our pool is freezing) he didn’t move his legs but I’m going to try again. I’m also going to get a ball and try balancing him on it. I have also been doing passive range of motion and massage. I’m just going to keep doing everything I can. Thank you again for the information! Andrea, Because your dog’s front foot knuckles under, I think you are on the right track to use aqua therapy for him. You might want to look at a book called Physical Therapy and Rehabilitation for Animals by Susan E. Davis. The author is one of the first canine physical therapists in the country. Her book is for owners who want to do PT at home with their dog. Don’t give up on your baby. My China Bear is now almost completely back to her normal self after a stroke that was almost a year ago. She is weak on her back right side and wobbles some, but it is so much better than the way she was when she came home from the neuro ER. It took a couple of months before I saw a glimmer of something from her. But I didn’t give up. I exercised her limbs 3 times a day. Oiled her down with some canine safe essential oils (mostly Frankincense). The harness helped the most! When she had it on, she thought that she was walking! It’s important to not vary from their routine. Even if they cannot actually do it yet. Make them feel as though they can. Your baby will amaze you! One day you will see each limb start moving a little more. They really are little miracles. Janie, I am so happy to hear that China Bear is back to her normal self. You did an amazing job taking care of her. I forgot to mention. Give your baby plenty of good massages several times a day with the essential oils! It will keep the blood flowing. Massage a drop or so of the oil at the base of the skull too. I’m sorry I haven’t responded. I had surgery and have been kinda down for a little while. Not able to get to my email, etc. Don’t let anyone tell you your baby cannot recover. Talk to him, love him, make him know that you are theIre for him no matter what. Give him/her a reason to push hard. Do you have a harness? It makes it so much easier to actually take them outside to go potty. My dog actually though that she was walking out there, squatting and doing everything herself. The fact is, when I brought her home, she couldn’t stand, walk, nothing. Be sure to feed you baby GOOD food, and also treats that are full of vitamins and other nutrients. I tried EVERYTHING! She still stumbles like she’s going to fall over sometimes, and I don’t dare let her go near the edge of anything. She wobbles too much.. One of her favorite things to do, use to be, to go up to the edge of the swimming pool and lay her head very close to the water. I raise my voice at her now when she gets close. Shes not stable enough for that. But considering how she was when she came home, she is SOOOOO much better now. I realize that she is 11, and this has taken a toll on her, but at least I have been able to buy some more time with her. She is SO worth it! Andrea please keep me posted. I am praying for your baby!! Feel free to call me if you need to 9042336824. I also purchased a baby boppy ?? One of those pillows to prop a baby up while they are nursing? Looks like a big doughnut with an opening? I would move China Bear around, propped up. I think it helped keep her from getting respiratory illnesses. It sounds silly I Know, but I even carried her around in a baby pouch on me. I wanted her to feel as normal as possible. At first it was very hard on her little sister. She didn’t understand what was going on. But having her close to her all of the time, I think helped as well. Janie, Thank you for reaching out to the other owners who left comments. I like your suggestions. My Junie is a Beagle and is almost 5 years old. She has a disc injury in her spine- diagnosed in December. She was still able to walk at that point. Less than two weeks ago, she got hit by her brother Benny while he was chasing a ball- she screamed but seemed ok. Two days later, got hit again by Benny getting excited by our neighbor, and within two days, couldn’t walk. I took her to the vet last Tuesday- he gave her all the meds- steroids, pain, and Gabapentin. Talked to vet today (he finally called me back) and he was not pleased that she was still not walking. He told me that everyday she doesn’t walk means she may have permanent paralysis. I’m devastated, but not giving up. If I pick up her up by her back end she can stand but her legs want to cross and knuckle. But once I place her feet correctly, she can stand for a few seconds but then her hind legs start to give out. She’s trying so very hard! I can’t give up because she is very much alive and alert, hungry, thirsty- all of it. Just can’t walk! Anyone ever have a dog paralyzed from disc injury and then can walk again? I’m really struggling here. She is precious and I am devoted to her, but need some guidance from someone who’s gone through it. I don’t want to go the surgery route- my option is Purdue, and since it’s a teaching hospital, I will guarantee that every possible test will be done and surgery will be recommended with no guarantee. I am not a fan of surgery- I can’t imagine putting Junie through that ordeal. Plus, I could never afford it right now and I’m pretty certain they don’t take payment plans. Any suggestions of what I can do while her disc injury is healing to maybe help her paralysis? Her vet pretty much wrote her off, but I won’t give up until I know I’ve done all I can to help her. Thank you so much for any advice- I really appreciate it! Caroline, I’m sorry to hear about your Beagle. You mention that your veterinarian is waiting to see if Junie’s spine heals from the roughhousing with Benny. Is your dog on crate rest? If so, you might want to talk with your veterinarian about the amount of exercise Junie should have or if you should wait for her to heal. If you get the okay, I suggest you talk to the vet about starting some gentle rehab exercises. The 6 exercises in this post are easy to do at home. I also like a book called Physical Therapy and Rehabilitation for Animals by Susan E. Davis. You can buy it on Amazon. You might also want to look into getting Junie a lifting support harness. I like the ones from Handicappedpets.com and Walkabout Harnesses. They are inexpensive. A harness will allow you to gently lift and move Junie without putting pressure on her organs. It also saves your back from lifting her. You can use a bath or beach towel until you get a harness. The towel wraps under her lower belly like a sling and you hold both ends of the towel to help her walk. The knuckling you mention is due to Junie not being able to feel where her feet are, but it is a good thing that she can stand when you correct it. Your other goal will be to keep her skin clean and dry if she is incontinent. The best way is to learn how to express her bladder. Paralyzed dogs are notorious for getting urine scald because they can’t get move after they’ve peed. Please look at my website for my free downloadable PDF of Essential Products for Paralyzed Dogs. You won’t need them all, but it will let you know the type of products pet owners use. Please also check out the Handi-capable pet video tab on the website. There is one about how to express a dog’s bladder. Please let me know if you have more questions. Best wishes to you and Junie. Thank you so much for your response- it really means so much to me as this has been a difficult time! Unfortunately, the vet that I thought was so wonderful a few months ago after Junie’s first episode has been nothing but unsupportive this time. He never called to see how she was, and when I called him and he finally called back, he was completely disinterested and not encouraging at all. Basically, he wrote her off and said he did all he could do and it’s time to get a specialist. I regret going to him in the first place. But on the bright side, I am ordering the harness today, and know it’s going to be a lifesaver for my back. I see improvement today in Junie and she seems much more comfortable. She is more relaxed and seems a bit more in control of her bladder. I ‘be done pretty well at keeping her clean but the video on expressing her bladder will be helpful- thank you for that! Another good thing is that I saw a deliberate move of her hind leg when I had her in the tub- I am hanging on to the idea that as the swelling goes down, she will feel her legs again. Maybe I’m over optimistic, I’m not sure, but I’m holding on to that for now! Thank you again for your kind words and helpful tips- it gives me the encouragement that I desperately need right now! Caroline, Thanks for getting back to me. I went through a similar experience with Sophie’s veterinarian. After 6 months of Sophie’s mobility get worse and worse she couldn’t understand why I wouldn’t let her go. I found a veterinarian who was supportive and tried procedures, like laser therapy, with her. I guess you will be shopping for a new veterinarian too. You might want to look for an integrative veterinarian. They utilize traditional Western medicine with alternative therapies. I’m glad Junie is doing better. Ajantha, I’m sorry to hear about your dog. Where on his body was he bit? Did the dog get his spine? Your best option would be to get your dog to a veterinarian for an evaluation. I think treatment depends on the damage done to the spine. If your dog isn’t in pain, you could talk to your vet about starting the gentle exercises in this article. Thank you for the article! My little Sophia, a Maltipoo, injured her back and she has hind-end paralysis. The Vet is hopeful that she will recover but says it will be a lengthy process. She is already showing improvement, and can move her hind legs around but she can not bear any weight. She was so excited when I used a lift handle to hold up her hind-end, that she took off running! I almost could not keep up with her. We have ordered a wheelchair for her, and the Vet recommended hydrotherapy. We tried that but she freaked out completely, and I m afraid she will injure herself in her panic (she hates the water). I have her in diapers and change her 6-8 times a day, whenever I notice she is wet. I use those opportunities to do ROM exercise, but now that I have watched the video, I will really work on the bicycling . Any suggestions for any other exercises sine she hates the water? One other question, do you have any resources for pattern for drag bag? I’ve modified some baby clothes but I am worried about her getting abrasions. Thanks again for all the good information! Beverly, I think you are on the right track with everything you are doing. I don’t know of a patter for sewing your own drag bags, but if you put one together I would be happy to share it with readers. As far as hydrotherapy, if your dog trusts you while she is in the water, I know of pet owners who have bought kid sized pools and have done hydrotherapy (swimming) with their dogs at home. If not, the range of motion exercises you are doing are great. Reading through these I am curious if any of you have heard about coonhound paralysis…it presents similar to a tick based illness. One day fine…next day paralyzed. Started with a limp on her right arm that wouldn’t go away; and worsen overnight despite the rest so we decided to do arthroscopic intervention (very costly) The specialist said she had bad torn ligaments and inflammation so the only treatment he could do is PRP and then have her wear an arness that restricts movement. 2 months passed and cero improvement; moreover, she lost her muscle mass. He did not have an explanation and said she might have a tumor and that there is nothing else he can do. We are devastated and scared even about the thought. She is in an ok mood, good appetite though she spends all day at home 🙁 Its been a while since we had to stop our daily walks. Anyone went through anything that can relate? Any advise? What can we try? Physio? Any excercise we can help her do at home to try to rebuild some muscle without worsening her inflammation? Yael, I am sorry about Belle’s condition. I am not a veterinarian, so please ask check with Belle’s vet before starting a rehab program. That said, I can’t imagine that starting easy “range of motion” exercises could cause her harm… unless of course she is in pain. Please ask your veterinarian about doing range of motion exercises with her and possibly starting her in water therapy. Aqua therapy and gentle swimming would move her limbs without putting any pressure on them. If you try them and she is in pain during or after or you see signs of increased inflammation, you’ll want to stop immediately. My 12 yr old Peke mix was hit by a car in mid August. We were convinced she had passed when we brought her back into the yard, but she suddenly started panting. We made her comfortable and by morning, she was much more alert, though not moving around at all. She lost several teeth, had a gash in her shoulder, and was paralyzed (though we didn’t realize that until a few days later). We gave her water with a little salt and sugar in it to keep her electrolytes up, and by the end of the 5th day, she was wanting to eat. However, when we finally did release her from bed rest and took her outside, she was unable to move her lower body at all. We did the pinch test and she had deep pain sensation, so we remained optimistic. I began slowly working with her on strengthening her muscles – utilizing your therapy suggestions but on a very small scale. Over time, she got stronger and was able to “walk” if I had her rear end in a sling. She could do her business if she was held that way, but still wasn’t able to use her legs to walk. About 3 weeks ago, she began wagging her tail, and little by little, she has begun walking on her own. The only thing she still is unable to do is climb stairs, but considering she was almost dead 7 weeks ago, she’s come a long way. It was your therapy suggestions that gave me hope that she might regain use of her legs. For that, I thank you immensely. She is back to being her usual full-of-attitude little self, and is enjoying life again. MJ, Thank you so much for sharing your story and for your kind words. You did a great job taking care of your dog. It was recently explained to me by a veterinary professional that if a dog can wag their tail; they will be able to walk again. Keep up the good work. Best wishes. Hi everyone. My boy(my little lovie- dachshund) had a disc herniation resulting in a moderate left side spinal cord compression on the 5th of Oct 2018. He was paralyzed in his rear legs & incontinent. I had a hemilaminectomy done on the 10th. Still not sure how I will pay for it; but I love him so much I could not give up on him. I searched the internet for all the exercises I could do & started. I came upon your site & thank you so much for all the info & links. A few days ago he started walking a bit-maybe 2 steps & he would fall over, get up & start again. I thanked the Lord for this blessing; but he is still not at 100%. He now does all his business outside alone also. My ?’s are: He is so happy to move that he just wants to go go. Should I limit him for awhile yet on walking so he doesn’t overdo it? 2. Should I still be giving him the Gabapentin? At his 6 wk. check-up the Dr. said he didn’t need any more meds; but that was before he took off trying to go-go-go.3. Should I still support him with a scarf? I will be starting him in my whirlpool tub as soon as I get a life jacket. Sorry for writing a book; but there doesn’t seem to be much info for after they start to wobble & try to walk. Thank you again for your wonderful site & help. Gloria, I’m glad your dachshund is feeling well enough to by on the go. Have you asked your veterinarian about how much activity your dog should be allowed to do at this point in his recovery? Maybe your vet can help you put together a plan for exercise. I love the idea of doing water therapy with him. I bet he’ll enjoy that. I think your overall plan will be to go slow so your dog doesn’t exhaust and reinjure himself. The other thing I want to recommend is a website called Dodgerslist. It is dedicated to healing dogs with IVDD (ruptured disc) in a conservative manner. You’ll find a list of steps to take to get your boy back to his normal self. And yes, if your dog is still falling, he and you will feel safer with support from a scarf or lifting harness. You can also use a canvas bag by cutting it in half and it will give you handles to hold onto your dog. My website has a video about it. Best wishes. We have a dog with spinal stenosis who is on an anti-inflammatory, tramadol, and gabapentin. I was hunting specifically for stretch or ROM for him so thanks very much for the specifics. Love your work here. Sophia, I happy you found the story helpful. I hope your dog feels better soon.